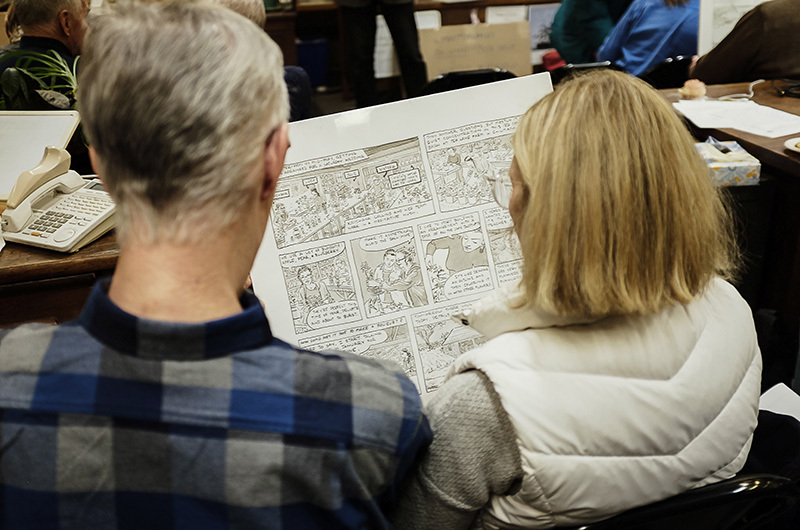 Tuesday in the Newsroom crowd heard the firsthand story of cartoonist Paul Karasik last week. Paul Karasik always wanted to be a cartoonist — as a kid he would collect superhero comics and flip through his parents’ collections of New Yorker cartoons. The only problem was he couldn’t draw. Later a breakthrough came when he was studying graphic design in art school and realized there are two key components to making a comic strip. Today Mr. Karasik is an award-winning cartoonist whose work appears in The New Yorker, Martha’s Vineyard Magazine and the Vineyard Gazette, among other publications. Taught early on by the cartoonist Art Spiegelman, he said he gained an understanding of the structure and language of comics and honed his visual style. In 1994, he published his first book, City of Glass, a graphic novel version of a book by Paul Auster. The adaptation won international acclaim and allowed Mr. Karasik to publish several other projects, including an illustrated memoir co-authored with his sister, and a collection of works by the mysterious comic book artist Fletcher Hanks. That project earned him a prestigious Eisner award for achievement in comic books. He said even better than winning the award was a glowing review from the American writer Kurt Vonnegut. 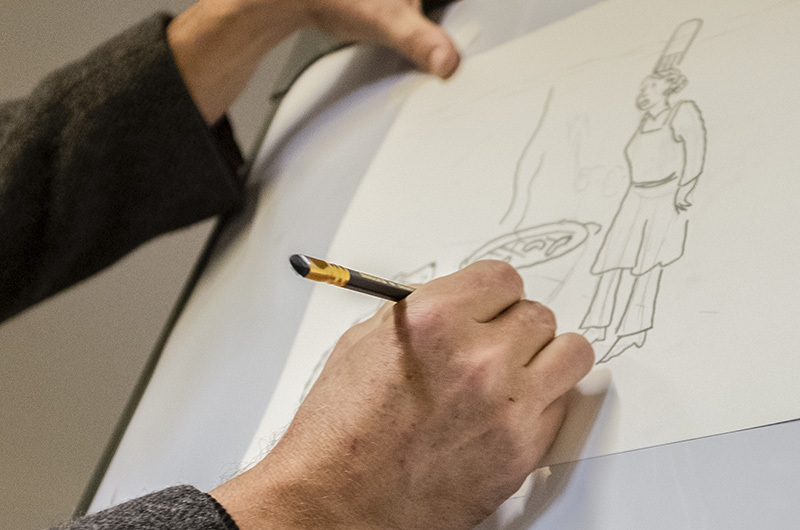 The student becomes the teacher in Mr. Karasik’s newest book How to Read Nancy, co-written with fellow cartoonist Mark Newgarden, where he posits that everything a person needs to know about drawing comics can be found in a single Nancy comic strip. Last week he gave the crowd a quick lesson in “spotting your blacks,” that is, leading the reader through a cartoon by the effective use of light and dark. 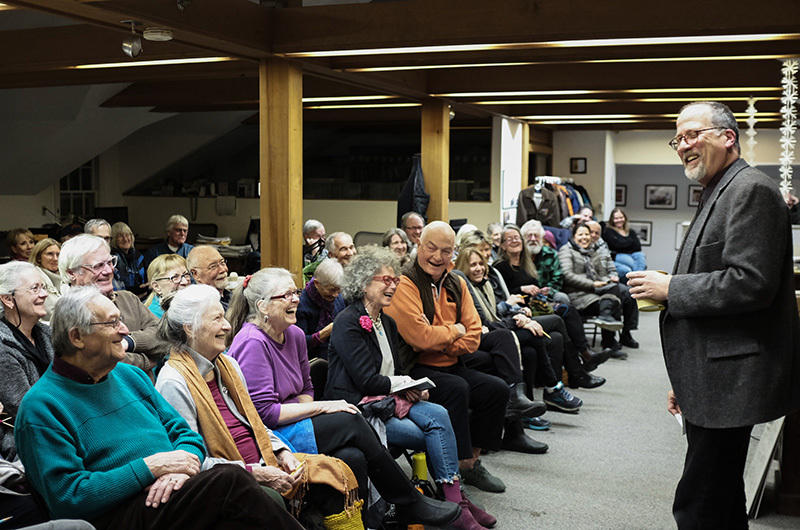 Mr. Karasik joked that while he has published several illustrated nonfiction works, his work for the New Yorker earns him the most attention at parties. “If I tell people that I have cartoons in the New Yorker magazine . . . suddenly they start pouring me a glass of Bordeaux and they’re my best friend,” he said to laughter. Describing his work routine, Mr. Karasik said he wakes up every Saturday morning, makes a pot of coffee and draws 10 cartoons in about three hours to submit to the New Yorker. He said keeping the regular practice schedule has been key in improving his drawings over the years. The talk was interactive. In the spirit of the New Yorker caption contest, Mr. Karasik asked the crowd to help him live draw a cartoon and submit captions on slips of paper. 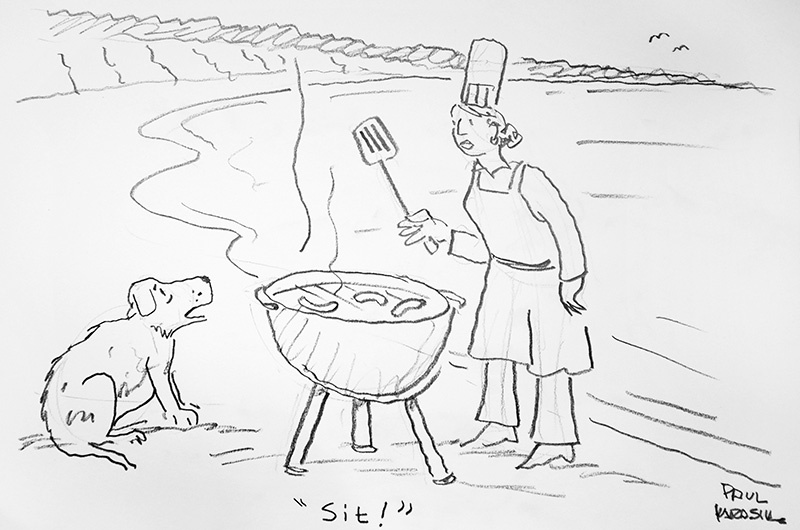 Using audience suggestions and an easel, he sketched a scene of a chef with her dog grilling hot dogs on a Chappaquiddick beach. The dog appeared concerned and looked up at its owner, mouth open. “Nine words or less wins the caption contest,” he said. The winner of this contest only needed one. “Sit!” said the dog, in the winning caption. The next Tuesday in the Newsroom will be held on Feb. 12. The speaker is writer and producer Victoria Riskin, the daughter of a movie star and an Oscar-winning screenwriter.